Whether you spend life on the road for pleasure or work, it’s nice to have the comforts of home as you travel the highways and byways. TRAILBLAZER checks in with folks who spend a fair amount of time on the road to see just what makes their home away from home. This month we chatted the authors of the bestselling RV road trip book, Driving Miss Norma—Tim Bauerschmidt & Ramie Liddle. 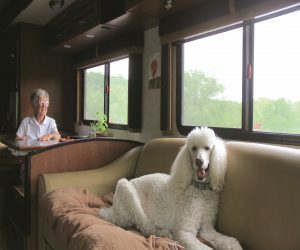 Packing only what she needed, Miss Norma took off on an unforgettable cross-country journey with three professional nomads—her retired son, Tim, his wife, Ramie, and their Standard Poodle Ringo—in a 36-foot RV. As detailed in Tim and Ramie’s poignantly touching book, Driving Miss Daisy, this once-timid woman says “yes” to living in the face of death. 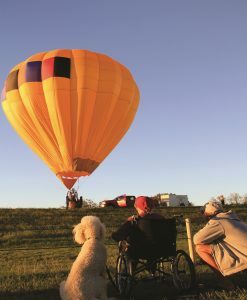 She tries regional foods for the first time, zip-lines through a former stranger’s yard, and even reaches for the clouds in a hot air balloon. With each passing mile (and one educational visit to a cannabis dispensary), Miss Norma’s health improved and conversations that had once been taboo began to unfold. Norma, Tim, and Ramie bonded in ways they had never expected, and their definitions of home, family, and friendship expanded. They met countless people from all walks of life— strangers who became fast friends and welcomed them. 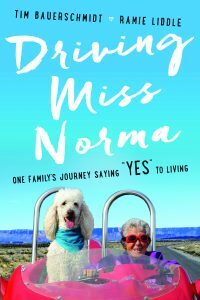 Driving Miss Norma is the charming and infectiously joyous chronicle of their experiences on the road—a transformative journey of living life on your own terms that shows us that it is never too late to begin an adventure, inspire hope or become a trailblazer. Tell us about your current RV. TIM: Our current RV is a 2011 Fleetwood Southwind 36D with a four-door Jeep Wrangler with paddle boards, kayaks, and mountain bikes attached in tow. Ramie and I have been diehard Airstream owners until now. We bought this rig specifically to provide Mom with a quality end-of-life experience. This model has a full drivers-side slide, a wide walkway to the back with plenty of room for a walker or wheelchair to maneuver, and room for two sleeping areas. The half-bath in the center and full bath in the back allowed for extra privacy. The comfortable Euro-chair and a washer/dryer were mandatory for our mobile assisted-living facility. Tell us about why and how your trip happened. RAMIE: Tim and I have been RVing since 2003 and went “full-time” in our 19’ Airstream Bambi in 2011. Our annual pilgrimage to northern Michigan to check in with Tim’s elderly parents in 2015 presented us with the inevitable. Tim’s dad, Leo, was dying. Two days after he died his mom, Norma, received a cancer diagnosis. She was very clear that at 90-years-old she didn’t want any medical intervention. She also knew that she could no longer care for herself at home. We offered two options that are typical of most adult children with elderly parents: Either move into a long-term care facility or move in with us. Tell us about the resulting book, Driving Miss Norma. TIM: When we began this trip, Mom was very sick and bereft. We were not sure she would make it very long before her health declined significantly. Ramie created the Facebook page, “Driving Miss Norma,” so her mother and a few of our friends could follow along. 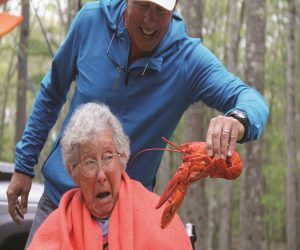 About six months into the trip, with Norma’s health seemingly improving, the page went viral and suddenly the whole world was watching what Miss Norma was doing from day to day. We traveled to 15 national parks, 32 states, and 13,000 miles on this epic trip. The book is about our travels, yes, but it is also about the emotional journey of tremendous joy, grief, kindness, love, and inspiration that we shared. I had the opportunity to get to know my mom on a level I could have never dreamed of otherwise. Our greatest hope is that our book will support families to have the difficult conversation about end-of-life wishes before it is too late. What’s your favorite thing about traveling in your RV versus staying in a hotel? TIM: We are always home. We don’t have to pack and unpack. We have our favorite things with us and most importantly, Ringo, our Standard Poodle, is with us all the time. RAMIE: We are also often much closer to the action. Frequently, when RVing, you can catch a hiking trail straight from your site and into the wilderness. We haven’t found that to be the case very often with hotel travel. What are a few favorite things onboard? RAMIE: There is no question that my favorite thing is my camera. RV travel is a photographer’s dream. TIM: We love to spoil ourselves and travel with an ice cream maker now that we have a large enough freezer. 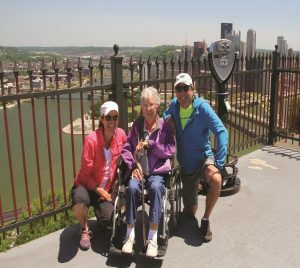 When we traveled with Mom, we found that her wheelchair was the ticket to freedom. She just loved it. Once we arrived at a new campground, the first thing we did was to get her wheelchair out so she [could] push her chair like a walker and explorer while Ramie and I hooked up the utilities. What are a few favorite destinations and why? RAMIE: We have traveled to every state but Alaska and are hard-pressed to pick a favorite destination. We love the American West and you cannot go wrong by visiting our stunning national and state parks. We had a spot in the California redwoods so close to a river that we were awoken [by] the sound of spawning salmon swimming upstream. It is also pretty great when you are in the French Quarter slurping oysters with your 90-year-old mother-in-law and listening to brass bands march by. The beautiful people of South Carolina and Georgia blew us away with their hospitality. And New England food can’t be beat. When Norma was asked this question she would answer, “Where I am right now.” A wise woman she was. From a Native American ceremony in New Mexico to wild horses in North Dakota and a hot air balloon ride in Florida, living in the present moment has been our most profound lesson in our travels. What about favorite rivers reached by RV? TIM: It is funny that you ask about rivers as we are about to embark on a journey around America’s Great Loop. The first stretch follows the rivers from Chicago, Illinois, to Mobile, Alabama. Ask us this question in a few months and we will no doubt have more to say. We love our rivers. The Green in Utah, the Rio Grande in New Mexico, and the Colorado just below the Hoover Dam are all great for kayaking to hot springs! Parked next to the mighty Mississippi in Vidalia, Louisiana we watched a hot air balloon flirt with a tugboat from the front window of our rig. But when it comes to rivers, I have a favorite memory of Mom sitting along the banks of the Big Thompson River in Loveland, Colorado, sipping tea, watching squirrels play, and reading her Clive Cussler novel, hoping that someday she could learn how to fly fish. What are some favorite meals onboard (or restaurants) on the road? RAMIE: I’d like to answer this one because I am married to an incredible chef! Tim is amazing in the kitchen and I eat very well every day, so we rarely dine out. When we welcomed Miss Norma aboard, we did go out more because we wanted her to experience local food and regional delicacies. That included pasties in northern Michigan, green chile in New Mexico, raw oysters in New Orleans, key lime pie in Florida, and lobster rolls in Maine. We regularly said “Yes, please,” to all the local delicacies. Do you have any funny stories from the road you can share? RAMIE: Tim and I love to paddle board and have carried our boards for thousands of miles, always hoping to spend some time in the water. However, Norma’s needs and our desire to enjoy our time with her eclipsed our paddling adventures on this trip. For a few days in early December, we were camped at Ochlockonee River State Park in North Florida and decided to paddle the river. We set Norma up in her wheelchair on a small strip of sand with her Sudoku puzzle book and knitting at hand. Tim and I took off on our boards for about an hour. When we returned Norma was waving to us like she was having a nice time. As we got closer to her little beach we noticed that the front wheels of her chair were in the water. It was only at that moment that we realized that the inland river was tidal and the tide was rising. Oops. Worried that she was nervous about sinking into the river we paddled faster to save her from impending doom when she simply looked up at us and asked, “Do you think I should take my shoes and socks off?” She did. What didn’t we ask you about your unique experience that you’d like to share? TIM: My mom’s last year of life could have been spent in a nursing home, with infrequent visits by me and Ramie. Traveling in the RV together made us engage with each other daily, and we included her in all of our decisions. It provided me with the opportunity to really get to know my mom, and for that, I am truly grateful. She died peacefully in the motorhome under the care of a wonderful hospice team on San Juan Island in Washington State. Would we do it again? Absolutely! We had a blast and have no regrets.